Chinese characters for "Clerical Script", in regular script (left) and clerical script (right). "Chancery script" redirects here. For the European style of writing, see Chancery hand. The clerical script (traditional Chinese: 隸書; simplified Chinese: 隶书; pinyin: lìshū; Japanese: 隷書体, Reishotai), also formerly chancery script, is an archaic style of Chinese calligraphy which evolved in the Warring States period to the Qin dynasty, was dominant in the Han dynasty, and remained in use through the Wei-Jin periods. Due to its high legibility to modern readers, it is still used for artistic flavor in a variety of functional applications such as headlines, signboards, and advertisements. This legibility stems from the highly rectilinear structure, a feature shared with modern regular script (kaishu). In structure and rectilinearity, it is generally similar to the modern script; however, in contrast with the tall to square modern script, it tends to be square to wide, and often has a pronounced, wavelike flaring of isolated major strokes, especially a dominant rightward or downward diagonal stroke. Some structures are also archaic. Clerical script is popularly but mistakenly thought to have developed or been invented in the early Han dynasty from the small seal script. There are also historical traditions dating to the Hàn dynasty which mistakenly attributed the creation of clerical script to the Qín dynasty and in particular to Chéng Miǎo, who was said to have invented it at the behest of Qin Shi Huang. Another traditional account is that it was invented by government scribes, in particular those involved in the justice and penal systems. However, from written materials unearthed by archaeologists, it is now known that all stages of Chinese writing underwent periods of natural evolution, and none of them were inventions by one person; this is true of clerical script as well. Furthermore, rather than being established by government scribes, it has been argued that clerical script was already in popular use, and the Qín dynasty use by scribes merely reflects this trend. Archaeological discoveries now clearly show that an immature form of clerical script ("proto-clerical") was already developing in the state of Qín during the Warring States period, and into the early Western Hàn; this can be seen on a number of bamboo books unearthed recently. Furthermore, the writing immediately preceding clerical script was not merely seal script; rather, there was a coexistence of seal script (the at-first dominant and formal style) alongside an increasingly popular but secondary form of "vulgar", "popular", or "common" writing which was very roughly executed and which was generally rectilinear. The popularity of this vulgar writing grew as the use of writing itself became more widespread. The structures and style of many of the characters executed in this vulgar writing were similar or even identical to their later clerical script counterparts, leading some to conclude that proto-clerical (and therefore clerical) script evolved not from seal script but from the vulgar writing of Qín which coexisted with seal script in Warring States to Qín dynasty. The Qín bamboo script is a good example of this transition, having evolved from vulgar Qín writing and considered by some to constitute Qín clerical script. The etymology of the Chinese name for the script lìshū (simplified Chinese: 隶书; traditional Chinese: 隸書) is uncertain. Lì meant a slave or prisoner serving the state, and thus, some infer that the script was used in recording the affairs related to such slaves, while others infer that it was used by prisoners conscripted as scribes. During Warring States, proto-clerical script emerged in casual, informal usage. During the Qin dynasty it appears to have also been used in some scribal capacity, but never in formal usage. Maturing into clerical script in the early Han, it soon became the dominant script for general purposes, while seal script remained in use for the most formal purposes such as some stelae, signet seals (name chops), and especially the titles of written works and stelae; some cursive was also in use at the time. Out of clerical script, a new form then emerged in the middle of the Eastern Han dynasty, which Qiu (2000, p. 113) terms "neo-clerical" script; it was from this neo-clerical and from cursive that by late in the Eastern Han semicursive would then evolve, out of which then emerged the modern standard script. Thus, the evolution from clerical script to standard script was not a direct step as commonly supposed. ↑ Qiu 2000, p.103, esp. footnote 28. 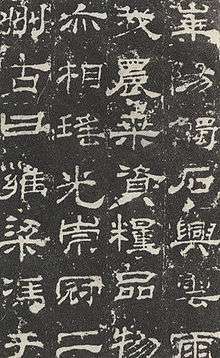 Qiu cites Caì Yōng as saying: "Cheng Miao got rid of ancient (script) and established the clerical script forms". ↑ Táng Lán 1979, p.165, cited in Qiu 2000, p.107; this does not, however, preclude influence by those scribes and even Cheng Miao in the process; as Qiu notes, Cheng Miao may have played a role in systematizing the script, thus leading to the mistaken tradition of his inventing it (Qiu p.107), much as Li Si's standardization of the already extant small seal script led to misperceptions that he had invented it. Wikimedia Commons has media related to Category:Clerical script.